Pittsburgh was the newest city to announce its bike-share plans this week, when it confirmed the city would add a 500-bike system by the spring of next year. But nearby Columbus, Ohio, will beat them to the punch. Ohio’s capital city is planning to add 300 bikes this summer. Meanwhile, Indianapolis’ plan was to roll out its system next month. The truth is you would be hard-pressed to find a large Midwestern city that hasn’t taken formal steps toward adding a bike-share system. Both Cleveland and Detroit are studying bike-share. Cincinnati completed a bike-share study late last year, and is now seeking proposals from contractors. Milwaukee is assembling money for a system. Chicago hopes to add 3,000 bikes this spring. And of course there’s the grandaddy of them all: Minneapolis’ Nice Ride. Launched in 2010, this system currently boasts more than 1,200 bikes. Late last year, the system surpassed half a million trips. Midwestern cities have been inspired by some of the more spectacular examples on the coasts, according to Eric Rogers, executive director of BikeWalkKC, the nonprofit organization that manages Kansas City’s bike-share system. Kansas City was a little ahead of the pack when it launched Kansas City B-Cycle, with 200 bikes at 12 stations, last summer. Midwestern metros have also been lured by the availability of new technology and the assistance of companies like B-Cycle and Alta Bikes that make installing these systems relatively easy and affordable. But these new additions to the bike-share family have taken a markedly different approach than some large coastal cities. Midwestern systems tend to be smaller and more conservative than those in major metros outside the region. 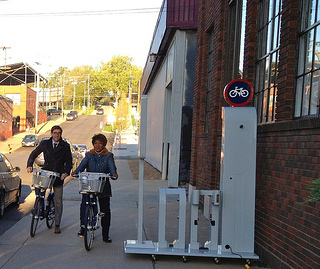 Washington, D.C.’s first SmartBike system failed precisely because of its small size. The city decided that a bike-share system needed to be big enough to be useful right from the get-go, and the phenomenal success of Capital Bikeshare has proven that they were on to something. Meanwhile, Kansas City’s start-small approach seems to be going as planned. BikeWalkKC got some additional federal air quality money to expand its system with eight stations this year, which will bring the citywide total to 20. Rogers says operating a successful system in the Midwest comes with its own challenges. Midwestern cities typically aren’t as densely populated as some larger coastal metros. They may also lack transit that facilitates bicycling, and especially bike-sharing. “There’s some pretty clear data that shows there’s more [bike-share] usage in a denser city,” he said. Kansas City was surprised, for example, to see far more leisure-time trips than commuting trips. Evenings, lunchtimes and weekends are the most popular times for bike rentals there. Special downtown events also lead to a spike in usage. The organization has tailored its marketing toward this crowd, Rogers said. One big question that remains is whether Midwestern systems will ever be financially self-supporting, as Washington D.C.’s Capital Bikeshare is becoming. The other question is whether that really matters. 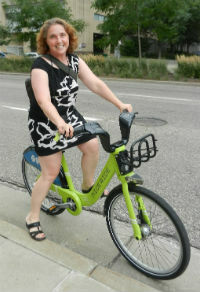 I’m hoping that a college town like Eau Claire, Wisconsin can have a bike share system next! Do people know of cities in the 50,000-100,000 range that have had bike share systems?! Oh yes. I overlooked that. I was trying to focus on just larger cities, but that’s definitely pertinent. 1. Only putting bikes in one part of the city. Not really much use if you have to go way out of your way to get and return the bike. 2. Tourist-unfriendly rules and instructions. I’m sure this is intentional (there’s money to be made gouging tourists on transit, obviously.) But on a personal level I find it aggravating as a tourist when I can’t use bike shares because the directions are only in other languages or a local ID is required. Except Mpls was well ahead of other cities including those on the coasts (I thought you were progressive?) and Chicago. Although to be fair, many Midwestern cities are being very boastful for being late to the table yet again. Anything B-cycle does is a guaranteed success. A shift to “smart-lock” will mean more bikes. There was talk a year or so ago about bikeshare in Grand Forks, North Dakota. The boathouse project is also going to supply bicycle rentals on our Greenway, so hopefully this will drive tourism traffic (and give us the problem of “not enough bicycles for people”). If you’re only putting in a limited number of stations, it’s better to put them in one part of the city. Spreading them out will only ensure that everyone has to go way out of their way, instead of just people living outside the coverage area. It also makes rebalancing more complicated, since people won’t have other stations nearby to potentially take/leave a bike. Riding a bicycle is too often thought of as an activity that's off-limits for many disabled people. And that has continued to be the case with the bike-share systems getting off the ground in several American cities, which provide standard bicycles meant for the able-bodied. But that's starting to change, thanks to a yearlong effort in Portland that's the first of its kind in the United States.